It’s kind of hard to describe in writing the next steps I took to get through the project. 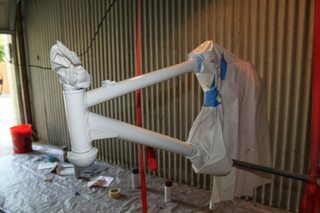 Keep in mind, each paint stage has several coats laid down and was given about 24 hours to cure enough for me to handle the frame in order to prep for the next stage. I’ll just lay out the pictures of the next stages and leave a brief description of what was going on. Like they say, a picture is worth a thousand words. 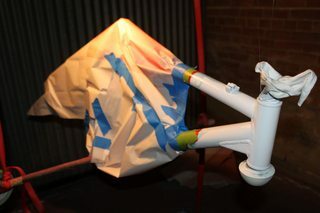 Painting the front base layer of the frame. 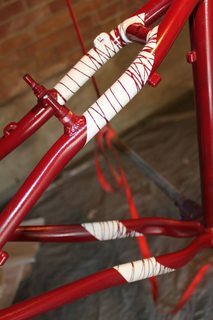 Notice the rear triangle is completely masked off to prevent over spray. More masking to get the detail I wanted without having overspray on the rest of the frame. Frame seat stay and chain stay detail. Frogtape. 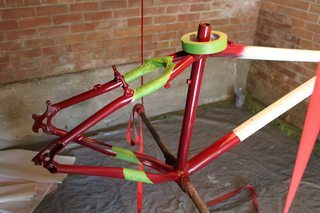 The ctrl+s of bike frame painting. 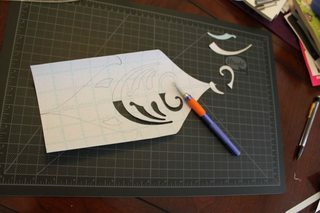 Apply the stencil to the frame slowly and carefully to avoid edge bubbles.. like the ones above! Red. Like a fire engine. 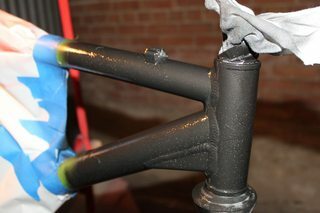 The last step was to paint the front end with the hammered black and to put a silly logo on the head tube of the bike. It wouldn’t be custom without a silly custom logo, no? The final stage of painting. I have the red masked now… if you look closely, you will notice that I have the stencil revealed where I want the details of the black coat to cut into the white. 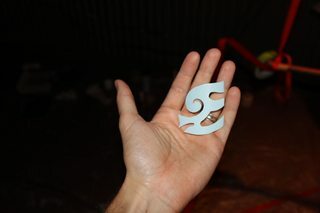 My silly bike logo.. this was placed front and center on the head tube. The Rust-oleum hammered black was actually my favorite paint out of this project. It has a pretty wicked finish that looks great on a bike. If I were to do a frame in a single color, I think I would grab one of the colors from the hammered finish line. Again, with all the coats, I did several passes with this color. The final coat of hammered black on the frame. Question if I’m doing a stencil on my bike once iv passed over it Afew times and the colour is covered well do I remove the stencil whilst the paint is still wet? Hey there, I let my paint dry before removing the stencil. I just had to be careful not to pull the stencil up to fast. I didn’t want to pull up dry paint with it! 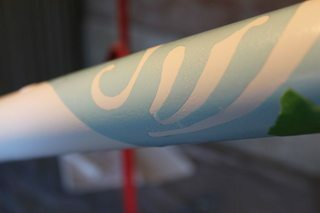 I’m guessing you could probably pull up the stencil once the paint has set (~1 hour or so) and be fine as well. if you get dribbles of paint.. do you just leave them to dry and then sand them off? Yes, sir. I’m guessing you’d probably want to give it a light pass with the rattle can after that to get rid of any sandpapper around the run. Hi! Great write-up. 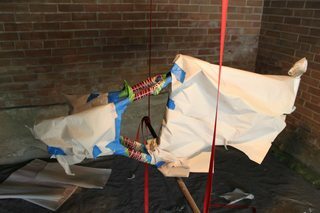 I was a bit confused on how long you waited before applying your second/third/fourth coats of paint and clear coat. Did you sand between every coat? 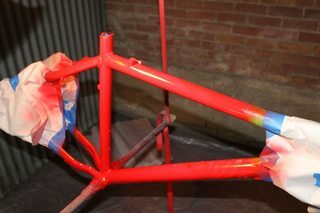 Say I wanted to paint a bike a single solid color. Should I do the primer, wait 24 hours, do several coats color, wait 24 hours and sand, then do the clear coat? After that let it sit for a week?